Hades is one of the playable Gods in SMITE. Inevitably, death sends everyone to Hades, God of the Underworld. In the end, he always gets his way. Eldest son of the Titans Cronus and Rhea, Hades was swallowed by his father as an infant along with five other siblings. Zeus, the youngest brother, escaped this fate and freed them once he’d grown strong enough to battle Cronus. Together, the six siblings defeated the Titans and banished them to the dark realm of Tartarus. Now the reigning Gods, Zeus, Poseidon, and Hades drew lots for dominion. Hades drew the Underworld. Of the few that have entered the Underworld and come back, all speak dismally of the place, never wishing to return. Yet Hades, himself, rarely leaves the subterranean realm, constantly seeking ways to grow the numbers of the dead. When he desired a wife, Hades captured the radiant Persephone, daughter of the Goddess Demeter. Concealed in the Underworld, none could reach her, so Demeter cursed the land with a great famine. The other Gods pleaded with her to end it lest she destroy mankind, but she would not relent until her daughter was returned. Hades finally let Persephone leave, though not before feeding her pomegranate seeds. Having consumed the fruit, she was bound forever to Hades and required to return to her husband once per year to eat of the seeds again. This, it is said, is a time of mourning and the cause of winter. While many fear death and view it as evil, in truth, Hades endeavors only to keep balance. He is stern but fair. As God of the Dead and the Underworld, he views his authority on this matter absolute, forbidding anyone to leave his realm and growing wrathful when disobeyed or when someone tries to cheat death or steal from him. For everyone, death is unavoidable and service to Hades inevitable. Even the Gods. Deals a total of 360/480/600/720/840 (+240% of your magical power) damage. Kill or Assist Lane Minions or Enemy gods to gain stacks. Lane Minions are worth 1 Stack and Enemy gods are worth 5 Stacks. At 75 Stacks Mage's Blessing Evolves, gaining 10% Cooldown Reduction. If you receive a kill or assist on an Enemy God all of your cooldowns are reduced by 1 seconds. Killing or assisting an enemy minion provides you with 1 stack, granting 1% Movement Speed and 6 Magical Power per stack. Stacks last for 15s and stack up to 5 times. Enemy gods provide 5 stacks. You gain additional Magical Power and Lifesteal scaled from missing Health. This caps at 100 power and 20% Lifesteal at 25% Health. Your damaging abilities reduce your target's Magical Protection by 10 for 5s (max. 5 Stacks). Your Healing obtained from Magical Lifesteal is increased by 40%. Your Magical power is increased by twice the amount of Magical Lifesteal you have. You gain +3 Magical Protection and +3 Physical Protection for each god kill or assist. At 7 stacks this item Evolves, providing a Health shield that gains stacks every 2s. Shield only stacks if you have not taken or d ealt damage in the last 5s. Each stack provides 10% of 100 Health +5 Per Level. Using this item grants all allied gods within 70 units 10% Increased Damage dealt to all targets, including objectives, and 15% Attack Speed increase for 5 seconds. Your Magic Damage ignores 15% of the target's Magic Protection. If the target has over 40 Magical Protections, this effect scales up to ignore a larger percentage of their protections. This caps at 45% Magical Penetration at 200 or more Magical Protection. Hades was one of the playable gods in the Alpha build of SMITE's first presentation to the public at PAX Prime 2011. 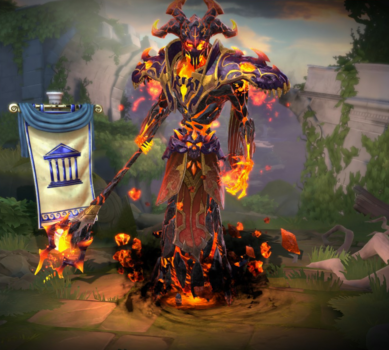 In February of 2016, at the start of Sesaon 3, Hades was reclassified from Guardian to Mage. Something similar happened with Vulcan. The voice actor who voiced Hades, Patrick Seitz, also voiced Chaac and Mountain Man Odin. Hades' current default skin used to be a 400 gems skin called "Nightmare" (which was originally a skin made as a replacement for Default Hades for the Chinese version of SMITE) that eventually ended up being switched in SMITE Beta Version 0.1.2044.1, with the original look being turned into the "Classic Hades" skin. Anyone who owned Hades before that update received the Classic Hades skin for free, and anyone who had purchased the Nightmare skin received a refund. This skin still uses the old Hades model. 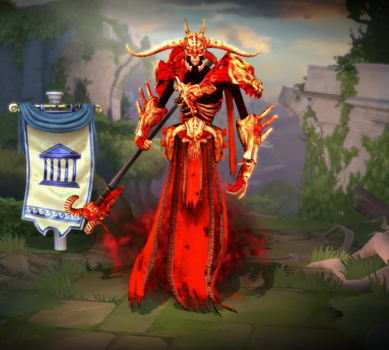 This skin used to be Hades default model, before it was switched with Nightmare. 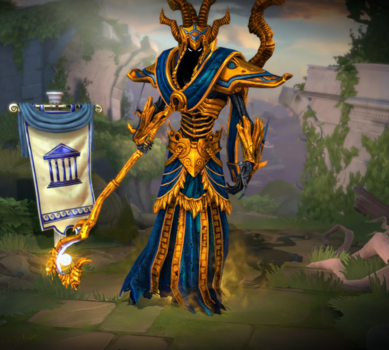 This is the first time a god received a classic skin, followed by Retrocles Hercules and Old Wa Nu Wa. This skin was also voiced by Patick Seitz. This skin was part of the Escape from the Underworld event. 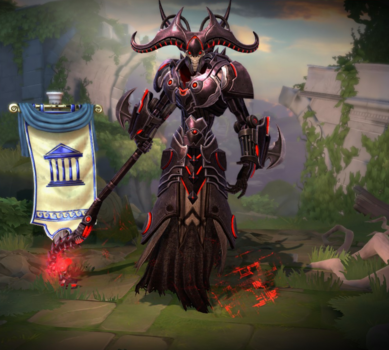 This skin shares its theme Grim Weaver Arachne, Grim Horseman Guan Yu, Grim Eclipse Hou Yi and Grim Shadow Nox. This was the first skin of the chibi set to be released in the game. One of Heebee Chibi Hades' taunts, "Think of the most horrible thing you can think of, and multiply it by six, 'cause that's me", is a reference to the Dreamworks film, Megamind. This skin shares its theme with Itty Bitty ChiBee Ah Muzen Cab, Sunny Chibi Amaterasu, Chompy Chibi Fenrir, Breezy Chibi Kukulkan, Beamy Chibi Ra and Beaky Chibi Thoth. This skin is based on a plague doctor. This skin shares its theme with Plague-bearer Izanami. This skin depicts Hades after the events of Odyssey 2018. This skin was part of the [Ragnarok] event. This skin could only be obtained by purchasing the SWC 2017 Digital Loot Pack bundle before January 2017. This skin was part of the Divine Uprising event. This skin could only be obtained by unlocking all 3 bundles from the Ragnarok event. This changelog is incomplete. You can help by expanding it with entries from previous Patch Notes. Increased Movement Speed from 355 to 365. Increased Protections from 60/70/80/90/100 to 60/85/110/135/160. Now has a debuff effect that lowers the targets Magical or Physical Power by 5%. This ability will still detonate and heal Hades if the target had Blight applied. Decreased Cooldown from 15/14/13/12/11 to 11s at all ranks. Increased Cooldown from 12s → 14s. Decreased Cooldown from 15/14/13/12/11 → 14/13/12/11/10s. Decreased Magical Power Scaling on the Detonate Heal from 15% → 10%. Reduced Physical Protection scaling from 3.2 → 2.6. Reduced Base Health from 490 → 450. Increased Base Attack Speed from .87 → .95. Increased Damage from 50/85/120/155/190 → 70/120/170/220/270. Reduced Mana cost from 80 → 60. This ability now deals Detonate Damage to the Target being Detonated. Reduced Mana cost from 65/75/85/95/105 → 60/65/70/75/80. Added new FX to show the radius of the Detonate from the affected Targets. Added new FX to show the radius during the warm up. Increased Protections from 60/65/70/75/80 → 60/70/80/90/100. Pillar of Agony no longer consumes Blight. Blighted Targets will now have their Magical Protections reduced before taking the first tick of damage. Duration increased from 5s → 8s. No longer Knocks Back Minions. Increased Protection buff from 40/50/60/70/80 → 60/65/70/75/80. Added achievements ‘Oh The Agony!’ and ‘Blighted’. Moved Class from Guardian → Mage. Reduced based Healing from 30/40/50/60/70 → 25/35/45/55/65. Added timer on the ground targeter indicating when the ability will expire. Blight detonated enemies now deal 50% of the damage to enemy gods, but still do full damage to other targets. 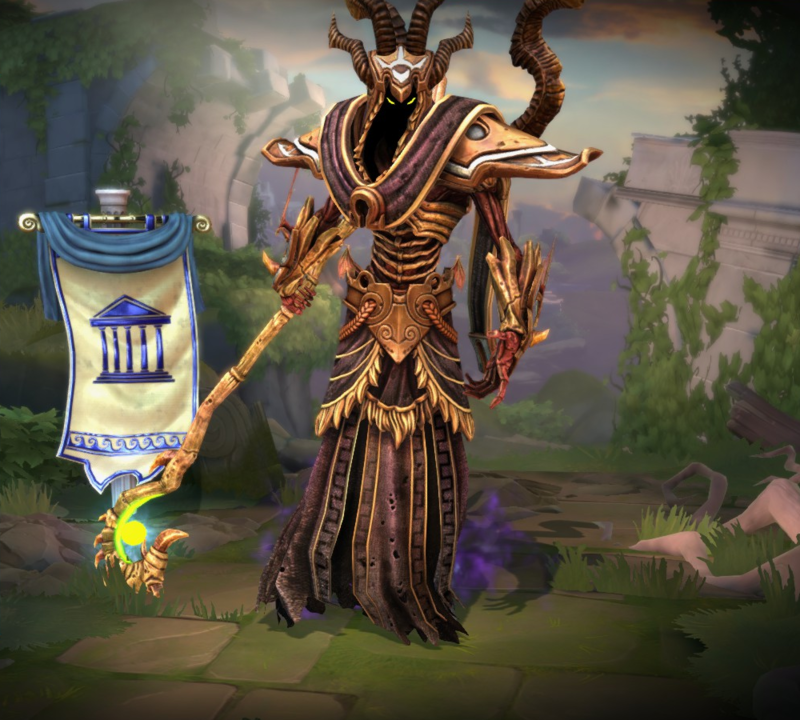 Fixed an issue with Hades' default skin showing up as his classic skin in match. The Nightmare skin for Hades has been switched to the default model for Hades. Gold and Legendary skins have also been updated to use this model as their base. The “Classic” skin is still in the game and has been given to everyone that owned Hades up until this patch. New players can purchase the classic skin for 200 gems or 9500 favor. 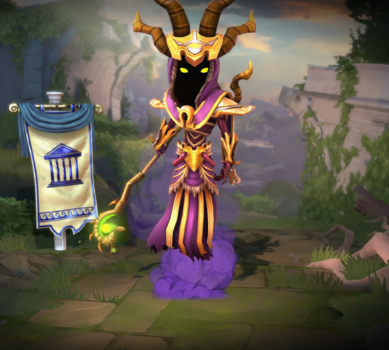 Players that previously purchased the Nightmare skin have all been refunded 400 gems. Damage reduced from 50/90/130/170/210 +70% to 50/85/120/155/190 + 60%. This ability now applies Blight to targets it hits. Now no longer applies the Silence to Blighted targets that are Feared. This fixes an issue with diminishing returns where the second effect applied was always having its duration reduced. Damage increased from 75/110/145/180/215 +60% to 75/115/155/195/235 +70%. Fixed issue where he would continue to play his FX and Animations even if the ability was cancelled prematurely. New loading screen card for default skin. The camera is now rotatable during this ability. The base damage has been reduced from 50/65/80/95/110 to 45/60/75/90/105. The magical power contribution has been reduced from 35% to 30% per tick. Basic attacks switched from dealing/scaling physical damage to magical. The FX that play on blighted enemies are more prominent. This page was last edited on 18 April 2019, at 18:15.